Dr Philip Mosley studied at the University of Oxford and obtained his medical degree in 2007. He worked as a junior doctor in Manchester before moving to Australia in 2009 to complete his specialist training in psychiatry. He is a Fellow of the Royal Australian and New Zealand College of Psychiatry and has completed an advanced certificate in Consultation-Liaison Psychiatry. As part of his training Dr Mosley also undertook a 2-year neuropsychiatry fellowship at the Royal Brisbane and Women’s Hospital and the Asia-Pacific Centre for Neuromodulation at the University of Queensland. During his career in psychiatry to date Dr Mosley has pursued a longstanding fascination with the brain and a curiosity about the interface between neurology, neurosurgery and psychiatry. He has pursued further study in neuropsychiatry, including such conditions as the senile and rapidly progressive dementias, antibody mediated encephalopathies, epilepsy and movement disorders including Tourette’s, Huntington’s and Parkinson’s disease. He is particularly interested in deep brain stimulation for neurological and psychiatric disorders; Dr Mosley’s position at the Asia-Pacific Centre for Neuromodulation has given him the opportunity to study this remarkable technology in considerable depth. Dr Mosley currently works as a member of the deep brain stimulation team at St. Andrew’s War Memorial Hospital and is fortunate to be in a position to transfer emerging scientific knowledge to the clinical sphere, ensuring that patients have the best outcomes from their surgery. Dr Mosley has a strong interest in academic psychiatry and has written a chapter in an edited Oxford textbook as well as several original journal articles, including guidelines for the management of neuropsychiatric issues after deep brain stimulation. He has enrolled in a PhD at the University of Queensland and is the principal investigator in a study of the effects of DBS for Parkinson’s disease on decision-making and relationship satisfaction. He is also an associate investigator in a clinical trial of DBS for obsessive-compulsive disorder. He has won prizes from the Royal Australian & New Zealand College of Psychiatry in Old Age Psychiatry and Consultation-Liaison Psychiatry, and he has received research funding from the RBWH Foundation and the RANZCP Young Investigator Grant. 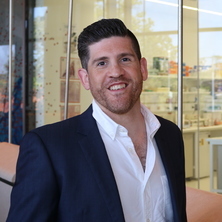 Dr Mosley has been awarded a prestigious Advance Queensland Early Career Fellowship for his Parkinson's disease research and won the postgraduate medal from the Australian Society for Medical Research for this work. Deep brain stimulation (DBS) is an effective treatment for Parkinson’s disease (PD). Motor symptoms and quality of life typically improve substantially. However, some patients suffer from psychiatric symptoms in the postoperative period. Even transient psychiatric issues can be upsetting, stressful for close family members and limit gains in quality of life despite good postoperative motor outcomes. A particular phenomenon that occurs in some patients after DBS is impulsivity, the tendency to act on the spur of the moment without foresight. Based on our clinical experience, we have identified impulsivity as a driver of postoperative relationship discord between the patient and their spouse. This is a meaningful problem as it can lead to long-term dissatisfaction with a successful surgical procedure. The goal of this investigation is to use a range of methods to study impulsivity after DBS, describe its effect on carer burden and examine its biological basis. Our findings may help us to improve the postoperative care of other patients with PD undertaking DBS and may allow us to identify certain patients who are more likely to suffer impulsivity after surgery. Furthermore, our examination of the anatomical and electrophysiological correlates of this phenomenon will shed light on the workings of the brain with applicability not only to PD but also other psychiatric disorders accompanied by impulsivity. Obsessive-compulsive disorder (OCD) is characterised by the intrusion of ego-dystonic, anxiety-provoking thoughts (obsessions). These are accompanied by mental acts or behaviours (compulsions), which must be carried out to neutralise the obsessions, or to mitigate anxiety associated with them. Sufferers may be excessively concerned with germs, preoccupied with symmetry or disturbed by intrusive violent, sexual or religious thoughts. Compulsions such as cleaning, ordering, checking and repeating may consume waking hours, such that the sufferer is functionally disabled. Pharmacological and psychological treatment is often unsatisfactory and residual symptoms persist. OCD is therefore often a chronic disorder with a detrimental effect on functioning across the lifespan. DBS is a promising therapy for severely unwell, treatment-refractory patients with OCD. The aim of this study is to determine electrophysiological markers to identify the optimal surgical target and the best stimulation parameters to treat OCD using DBS therapy. Tourette’s syndrome (TS) is a neurological disorder that develops in childhood. Individuals with TS make involuntary movements and vocalisations (known as tics), which may be painful, embarrassing and functionally impairing. There is no cure for TS, but certain medications (particularly antipsychotics) are effective at suppressing tics when taken continuously. Unfortunately, these medications have significant side effects, which limit their acceptability for many sufferers. The human body has its own cannabinoid neurotransmitter system, which is implicated in the control of normal movement and the development of movement disorders such as TS. The “endocannabinoid” system could be a new therapeutic target for tic suppression. This is the first Australasian, investigator-led, randomised, placebo-controlled, double-blind trial of medicinal cannabis (tetrahydrocannabinol and cannabidiol) for the treatment of TS. We will evaluate changes in tic severity, psychiatric and cognitive symptoms, as well as quality of life and qualitative outcomes. We will measure endogenous serum cannabinoid levels in TS, as this may predict response to active treatment. Mosley, Philip and Lyness, Jeffrey (2014). Physical co-morbidity with mood disorders. In Nancy A. Pachana and Ken Laidlaw (Ed. ), The Oxford handbook of clinical geropsychology (pp. 436-469) Oxford, United Kingom: Oxford University Press.